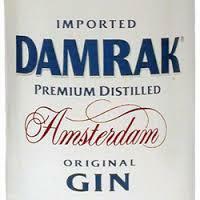 DAMRAK Gin is an exceptionally smooth gin with a less pronounced juniper flavor instead favouring more citrus flavours. Based on his extensive experience and expertise our Master distiller has created this unique gin recipe. A combination of five distillations and bottled at 41.8% Alc/Vol. (83.6 proof), DAMRAK Gin has a sweet orange aroma giving way to candied pine. On the palate, the citrus leads followed by licorice, coriander, and a subtle juniper flavour. With a subdued juniper flavour coming to the fore, the 16 other botanicals such as orange, citrus, honeysuckle and an array of spicy and sweet herbs, combine to create an intricate mix that makes DAMRAK Gin the most pleasant gin to drink.